It's not Reid's fault, really, that he's forever being nationally de-pantsed. The political winds just keep forcing him to leave his trousers at half-mast. 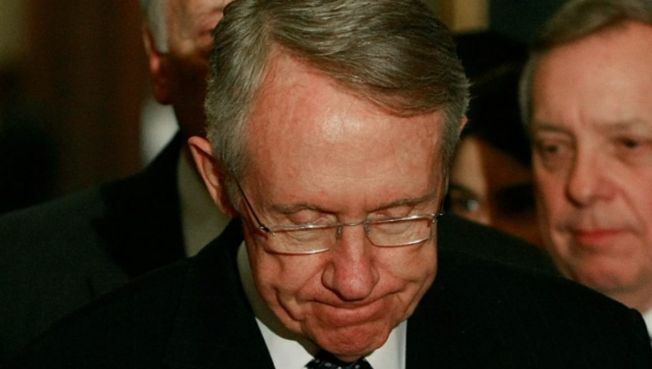 If there is one thing to know about Senate Majority Leader Harry Reid, it is this: he always gives up. Sure, you'll hear about how he's a "fighter" and a former boxer and all that, but he capitulates in run-ins with the President, with Republicans, with Joe Lieberman, and now with his fellow Democrats Rod Blagojevich and Roland Burris. It's not his fault, really, that he's forever being nationally de-pantsed. The political winds just keep forcing him to leave his trousers at half-mast. Consider the Burris problem. For those readers lately emerging from comas, here is the deal: Once upon a time, there was a Democratic governor with a pathologically lush head of hair who liked to say the F-word a lot. This governor was arrested for maybe, allegedly, plotting to sell off the newly vacated Senate seat of Barack Obama to the highest bidder. When this news came out, what choice did poor Harry Reid have but to denounce this awful miscreant Blagojevich in the strongest of terms? If there was anything we learned from the presidential campaign, it's that responsible politicians must vigorously denounce and reject any of their associates, however distant, who carry even the faintest whiff of scandal. If the denunciation is too tepid, or the rejection too late, the non-offending politician is forced to marinate in the stink of his offensive colleague for at least a news cycle or two. So Harry Reid declared that Rod Blagojevich was horribly, irreparably tainted and would be shunned by his fellow Democrats, who would not cross the street to urinate on him if he was on fire. Reid also promised that should Blagojevich have the temerity to actually nominate someone for Obama's seat, that person would be likewise shunned and so on. After all, even the most worthy nominee would be infected by the noxious scorching taint of Blagojevich, and thus obviously unfit to lead. This all sounded great except that there was really nothing Harry Reid or any other Senate Democrat could actually do to keep a Blagojevich appointee from taking office. It was hoped that nobody would notice this. But of course the governor of Illinois noticed this, and very sensibly called Reid's bluff by appointing Roland Burris, some guy whom Obama didn't want and Blagojevich hadn't bothered to shake down. Burris was a harmless Chicago politician who had failed at running for Senate and governor and mayor of Chicago, and he already erected a narcissistic death tomb for himself, so he was obviously a great choice for the state of Illinois. As an extra bonus, Burris is a kindly old black gentleman, so that everyone's surrogates could raise the awful specter of racism if Harry Reid insisted on continuing to pretend he had any power whatsoever to block the appointee. And this was precisely, predictably, what happened. Reid, after promising there was absolutely no way for Roland Burris to be seated due to the taint and "cloud of corruption" surrounding his patron, modified his position. A laughable little trial balloon was floated, suggesting that maybe Burris could be seated as long as he promised not to run in two years. Bobby Rush and a host of other Burris/Blagojevich surrogates spent all week hollering into teevee cameras about what a despicable racist Harry Reid was. Harry Reid caved. And that is why Harry Reid has the worst job in America. Sara K. Smith writes for Wonkette when she is not being followed around by Rod Blagojevich's cloud of corruption.